When a SPM is added in between solute and solution the water molecules move towards salt water even though the concentration is same both sides. Why does this happen? 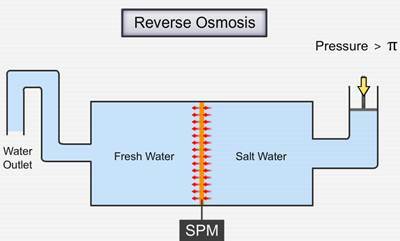 According to SPM's perspective, concentration (of water) at salt water side is lower than that at fresh water side but how does that change the fact that the overall concentration is same both sides? My book says it depends on vapour pressure. If that's the case then osmosis should take place without SPM because it depends only on vapour pressure? Here what happens is that the fresh water is a pure solvent and a pure solvent always has a greater vapor pressure than that of a solution. So due to the greater vapor pressure on water's side, the molecules of water will experience a force in salt water's direction as the pressure is less in salt water side. Therefore the water will flow towards the salt water. Not the answer you're looking for? Browse other questions tagged solutions osmosis or ask your own question. How can you explain the energy change in this phenomenon?